At times it can get monotonous reading newspaper accounts of Elvis Presley on tour in 1956. As Elvis crisscrossed the country performing mostly one-nighters in 79 American cities, local writers in their reviews often waxed repetitive in describing the Presley whirlwind that had passed through their communities. In attempting to describe what to them was indescribable, most journalists focused on the screaming, the twitching, the gyrating, and the barely audible singing, along with Elvis’s unmanageable hair and flashy clothing. The result was rarely flattering for Presley. 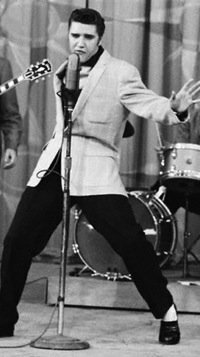 Occasionally, though, a reporter approached Elvis’s show from a different angle, often resulting in an unusual and informative newspaper article. One such journalist was Polly Thomas, a staff writer for the Journal Herald in Dayton, Ohio. She reviewed Presley’s afternoon show at the University of Dayton Fieldhouse on May 27, 1956. Unlike most reporters in 1956, however, Mrs. Thomas did not attend Elvis show alone. She shared the experience with her 14-year-old daughter. “Mother Explores Daughter’s Craze For Elvis” was the headline over Thomas’ entertaining article in the Herald two days later. “Take the ‘bull by the horns.’ That’s the least a mother can do,” Thomas proclaimed in the opening line of her essay. She described her daughter Toni as an “average teen-ager in an average family.” Other than school, church, and family, Toni, like most her age, had not been particularly devoted to anything else in her young life. She was studying classical music, although her mother admitted she was not particularly musical. And she had taken ballet and toe-dancing lessons, despite a lack of natural inclination for dancing. Toni’s parents talked it over and decided it was best to put their foot down. They allowed her to play her Presley records just once a day and made classical records available to her. It didn’t work. Like thousands of other parents, they were overwhelmed by Presley’s expanding fame and their daughter’s growing enthusiasm for him. Why did he have such a hold on teen-agers? After arriving at the Fieldhouse that Sunday afternoon, the Thomas family, along with 2,000 other fans, sat through a procession of opening acts. Mrs. Thomas judged the first half of the show “far above average,” but Toni was restless throughout. She and the other girls started getting fidgety. Elvis was running late. When he finally appeared at the Fieldhouse’s side entrance, about 50 girls left their seats to watch him through a grating barrier. “Their hysterical squeals touched off the rest of the pack,” Thomas reported. One expected to see the grand entrance of a six-foot-tall master of moods and music. It was hard to realize that the young man who mounted the stage in one graceful leap—that youngster clad in navy blue trousers, blue shirt and bright green sport coat—was the cause of so much pandemonium. As Elvis’s show unfolded, Toni screeched, “Isn’t he WONDERFUL?” Her mother didn’t answer. She was busy watching Presley closely and trying to understand the secret of his attraction. Her observations, recorded in her Herald article, revealed an intuitive understanding far beyond that of most other Presley observers in 1956. He took them ecstatically through all conceivable contortions of voice and body. Beyond all precedence, he worked tirelessly, as though he were offering himself to some strange medium, understood only by those who feel beyond all feeling. The obvious gyrations, to the unartistic eye (most of all, mine) may have appeared ribald. But in all fairness, I must admit that there is an explanatory background that lifts them into the field of art. 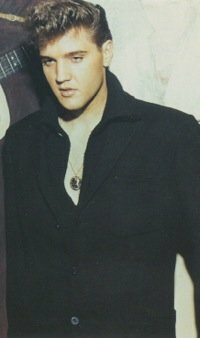 Elvis was born in Tupelo, Miss., and spent his childhood days in the deep south. As a child he heard the plaintive chants and blues and saw potential shoe-shine boys ‘jig’ until they were exhausted. He captured the beat of the south and began to take part in amateur productions. Performing was as natural as breathing. That primitive almost savage expression may be, in itself, a part of the hypnotic fascination. Then, too, the young southerner with straight, slicked-back hair and long sideburns, is dedicated to his audience. He sets his course and steers it straight, completely oblivious and uninhibited. 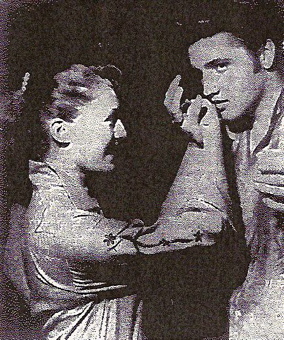 After the show, Thomas’s newspaper connection earned her and her daughter access to Presley in his dressing room. They found Elvis easy to meet. He told them about his parents and mentioned that he was heading for Memphis to spend some time with them. “Toni’s reaction to Presley, the boy,” Thomas observed, “was probably the same as that of any other teen-ager he sees after the show. She was calm and collected and chatted freely as she would with any youngster.” The mother sighed with relief. “It was not entirely a Pied Piper story,” she realized.